1985 Topps WWF Pro Wrestling Stars brought wrestling cards into the mainstream. The first set licensed by the WWF, it features some of the earliest cards of legends like Hulk Hogan and Rowdy Roddy Piper. 1985 saw professional wrestling entering a phase of unprecedented mainstream popularity. Under the aggressive leadership of Vince McMahon, WWF took wrestling from a series of regional promotions to an international powerhouse. The likes of Hulk Hogan, Jimmy "Superfly" Snuka, Wendi Richter and Junk Yard Dog were all household names. Wrestlemania was shaping pay-per-view. Naturally, a full-fledged set of trading cards was a natural extension of WWF's growing pop culture status. Although other wrestling card sets predate 1985 Topps WWF Pro Wrestling Stars, most notably the two 1982 Wrestling All-Stars sets, this is the first to be recognized by the most powerful promotion in the business. The 1985 Topps WWF Pro Wrestling Stars checklist follows the structure of most Topps entertainment releases of the 1980s. The base set has 66 cards. There is also a set of 22 stickers. Base cards are divided into three distinct sections. The first 21 cards are the most popular in the set. This is where the various WWF superstars are profiled, much like a basic sports player card. Cards 22 through 56 make up the Ringside Action subset. In-ring action is combined with catchy captions. The final ten cards are called Superstar Speaks. The have a TV design and have speech bubbles from the featured wrestlers and personalities. Every pack also has one of 22 different stickers. Closely resembling other Topps stickers from the era, a die-cut superstar photo has a thick colored border. A black background has a tightly cropped wrestling ring. 1985 Topps WWF Pro Wrestling Stars remains one of the most popular wrestling card sets in the hobby. 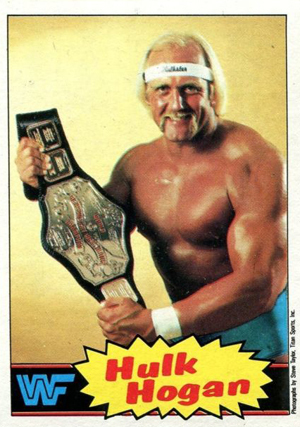 Cards featuring prominent stars, particularly Hulk Hogan, command a premium on the secondary market. The set is also the basis of 2012 Topps WWE Heritage. 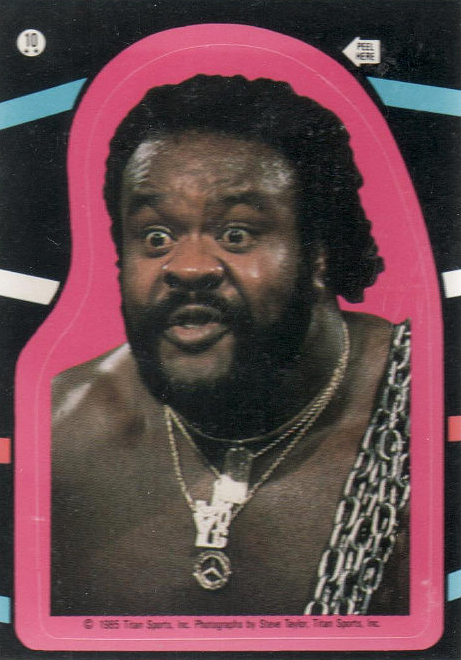 1985 Topps WWF (WWE) Wrestling Sticker-Iron Shiek • Go Get Your Camel Clutch On! 32 Putting On The Pressure! 33 Smashed On The Knee! 54 Crusher In A Crusher!